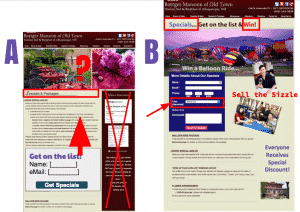 We reviewed this A/B concept for an Inn during the webinar. This is rough, but the B version shows elements used to persuade visitors to fill out the form. 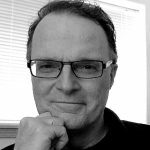 I always enjoy the webinars and online trainings we do because it pushes me, as an instructor, to come up on answers and solutions for questions students ask. Keep those questions coming! Do you have more examples of optimized landing pages? Yes. 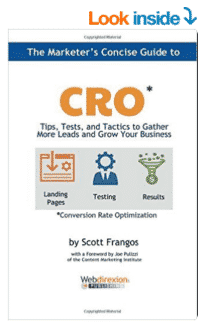 • My new book, The Marketer’s Concise Guide to CRO, contains an appendix with a Hotel A/B test plus a ton of other CRO (Conversion Rate Optimization) and landing page tools, tips and tactics. Get it on Amazon. 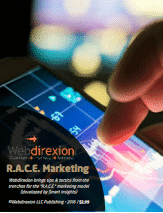 • We have an article section on CRO, here at Webdirexion, and will be posting before and after A/B tests for the hospitality industries as we go. 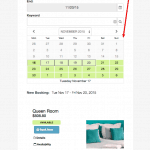 Example (click to enlarge) of responsive booking page from our demo site featuring Checkfront cloud booking system. What is the difference between Responsive and Adaptive design? It’s no wonder there is confusion, because programmers, designers, and gurus all have slightly different definitions. There is some overlap between the two concepts. Basically we’re talking about building your website so that it functions well for users with larger screens, and also smoothly switches to a smart interface optimized for mobile users. For example, our demo booking page featuring Checkfront at right (click to enlarge) is responsive in that it resizes smoothly from desktop size down to smart phone width. It also has a function that “adapts” the menu bar to a single pop-down to fit better on small screens. There’s also an “app” like interface solution that presents a different look and feel for mobile users, and is optimized for their use. You use the same content — no need for a duplicate website. What are some “magic words” to help capture attention on landing pages? Specials. Win. Save. Promotion. Discount. On Sale. Tickets. Give-away. Contest. These are words that call for your intention and imply an incentive for your visitors to complete an action (a “conversion”) you want them to take. 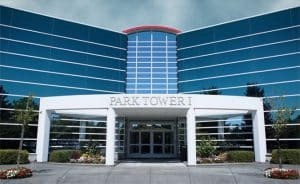 Does LinkedIn have value for BnBs? Yes. Especially if you have a meeting space, and you think in terms of business retreats which are a good way to drum up some business in the off-season. You should always include LinkedIn in the “Big 4” (Facebook, Twitter, G+, LinkedIn) and set your blogs to automatically post there. Plus… consider advertising ON LinkedIn for your business retreats with appropriate targeting and business group ad placements. Remember Heather’s tip (form the webinar) to use the forums. Finally, use LinkedIn to connect with allied business people in your area and keep them informed of what you are doing at your property. What about using different analytics programs (AWStats was mentioned) to track visitor behavior? AWStats is a program that a lot of web hosts offer as simpler sort of “log file visualization”. I did some research and while you can get some activity numbers this way, AWStats won’t help you with conversion issues, website goals, nor measure the effectiveness of your SEO or marketing campaigns. This is why I would continue to recommend Google Analytics — it’s free (you just need a free gmail account), and it offers goal setting and tracking along with its own A/B testing technology called “Content Experiments” which we reviewed in the webinar. Feel free to write to us with any other questions about Inn and Hotel marketing. I will collect your questions and cover them in future blog posts.